In 1998 Professor Haïssaguerre and his colleagues made the initial observation in patients that triggering foci in or around the pulmonary veins initiate some types of atrial fibrillation. Since then it has become clear that atrial fibrillation and other atrial tachyarrhythmias can be initiated (and possibly maintained) by triggering foci in any of the thoracic veins. This concept is now one of the most current topics in electrophysiology, and while it is a topic of frequent discussion in the major cardiology and electrophysiology journals, Thoracic Vein Arrhythmias: Mechanisms and Treatment is the first state-of-the art multi-authored textbook that integrates the advances made in this rapidly developing new area of cardiac arrhythmias for the global community. Edited by Drs. Shih-Ann Chen, Michel Haïssaguerre, and Douglas P. Zipes, who are at the forefront of advances in this field of cardiology, and with contributions from authors representing an international array of authorities in their individual fields, this text will be an invaluable reference to students, basic scientists, and clinicians with an interest in any aspect of cardiac arrhythmia. 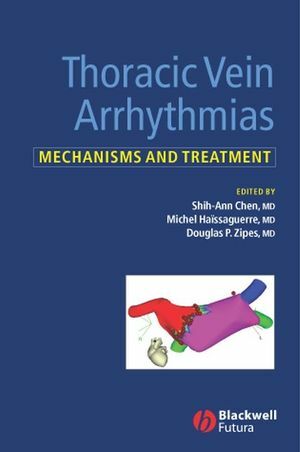 First textbook to provide comprehensive, critical and insightful review by leading experts in the exciting field of thoracic vein arrhythmias. Contains review of the current status of thoracic vein arrhythmias, and speculation on how the new findings will impact on treatment of cardiac arrhythmias. The chapters outline how progress is being made on several fronts ranging from basic mechanisms to invasive treatment for thoracic vein arrhythmias. Part I History of Thoracic Vein Arrhythmias. 1. History of Thoracic Vein Arrhythmias: Pulmonary Veins and Venae Cavae. 2. The Ligament of Marshall. 3. Coronary Sinus Electrophysiology and Arrhythmogenesis: Historical Developments. Part II Anatomy and Basic Electrophysiology of the Thoracic Veins. 4. Anatomy of the Pulmonary Veins. 5. Anatomy of Pulmonary Vein-Atrial Junction. 6. Anatomy of the Vena Cava: An Electrophysiological Perspective. 7. Anatomy of the Coronary Sinus. 8. Imaging of Cardiac and Thoracic Veins. 9. Immunohistology of Thoracic Veins. 10. Ionic Currents and Mechanisms of Ectopy from Thoracic Veins. 11. Stretch-Related Atrial Remodelling: Role in the Genesis of Atrial Fibrillation. 12. High-Density Mapping of Thoracic Vein Arrhythmias. 13. Optical Mapping of Thoracic Vein Arrhythmias. 14. Effects of Electrical Stimulation of Autonomic Ganglia At Thoracic Veins. 15. Maintenance of AF: Thoracic Vein or Atrial Substrate?. Part III Clinical Electrophysiology and Ablation Therapy of Thoracic Vein Atrial Fibrillation. 16. Electrocardiographic Characteristics of AF Initiators from the Thoracic Veins. 17. Mapping of Atrial Fibrillation Initiators From the Thoracic Veins. 18. Autonomic Modulation of Thoracic Vein AF. 19. Clinical Electrophysiology of Pulmonary Veins. 20. Catheter Ablation of Pulmonary Vein Atrial Fibrillation: Circumferential Ablation..
21. Catheter Ablation of Pulmonary Vein Atrial Fibrillation: Segmental and Limited Linear Ablation. 22. Clinical Electrophysiology and Catheter Ablation of Atrial Fibrillation from Superior Vena Cava. 23. Clinical Electrophysiology and Catheter Ablation of Atrial Fibrillation from the Ligament of Marshall. 24. Clinical Electrophysiology and Catheter Ablation of the Coronary Sinus in Patients with Atrial Fibrillation. 25. Pulmonary Vein Isolation for Treatment of Atrial Fibrillation in Patients with Structural Heart Disease. 26. Role of Linear Ablation in Thoracic Vein AF. 27. New Technologies for Catheter Isolation of Pulmonary Veins. 28. Surgical Ablation of AF: Pulmonary Vein Isolation. "The strength of this book lies in the presentation of the information. The authors first provide the background basic science including the mechanisms involved and follow this with clinical information." "The field of thoracic veins and their ability to initiate and/or sustain atrial fibrillation is exciting and rapidly evolving. The authors have done an outstanding job in the first text of its kind. This is a comprehensive review of the subject which identifies areas which need further research. This is without doubt the definitive text on thoracic vein arrhythmias to date and is a must-read for anyone interested in the field of cardiac electrophysiology."